I usually cringe when someone says “you’ll enjoy this book, it’s weird”. This usually comes from well meaning friends who know of my affinity for Lovecraft and other “weird fiction”. What they don’t know is that I am terribly picky about what I will and will not read and more often than not, a recommended book ends up unfinished. I have this little rule you see.. if I am not “into” a novel by the mid-way point, I put it away and most usually never return to it. Life is short, I will not waste valuable reading time on something merely because someone else enjoyed it. 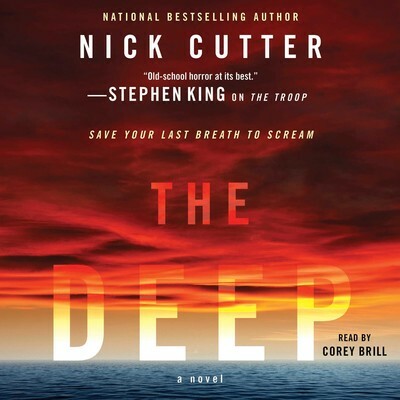 The Deep by Nick Cutter was not a put aside at or before the half way point. The Deep is true to form, traditional, thoroughly enjoyable if not a tad disturbing at times (in a good way) weird fiction. I loved it. It has been reviewed elsewhere and I will not summarize it here because frankly even giving away as much as is on the description on the cover is more than you should be allowed. Leave it to say it is damn good. It is scary. It will give you the willies and will make you jump when you hear a noise behind you in the basement after you shut off the light. I give it 4.5 out of 5.0. (and I cannot even tell you the MINOR small petite little thing I wish had been explained a bit further because even giving you that may ruin the surprise for you). Buy this book, read it exclusively at night, preferably by candle light near water.